Sferyx JSyndrome HTMLEditor is a JavaTM component suitable for use in any Java application which needs HTML document authoring. IIt allows the creation of complex HTML documents visually and also automatic upload with support for PHP, ASP/.Net, JSP/Servlets, ColdFusion, Perl, Oracle Forms, etc, Spellchecker, Source Editor with syntax highlighting and Preview. Sferyx JSyndrome HTMLEditor Applet Edition is a JavaTM applet which is intended for java developers as well for webmasters, designers and any kind of end users which may need to incorporate advanced HTML authoring into their websites. It is ready for immediate use and does not require any programming experience to be incorporated and integrated with existing web sites and content management systems. · Allows the creation of complex HTML documents visually and also automatic upload with support for PHP, ASP/.Net, JSP/Servlets, ColdFusion, Perl etc, Spellchecker, Source Editor with syntax highlighting and Preview. Sferyx JSyndrome PDF Generator is a powerful PDF generation Java component. It is suitable for use in any kind of Java applications which need advanced PDF document creation, generation and conversion - it supports also Oracle Forms and has Oracle Reports generation features - allows immediate creation of full Rich Text PDF reports from any Oracle Report. It includes all the necessary features to convert even very complicated HTML documents easily, includes headless server-side compatibility and can be deployed instantly on any system which has JRE/JDK 1.3 or higher. Sferyx PDF Export Add-on is an additional plug-in component for the Sferyx JSyndrome HTML Editor products family both Component and Applet Editions. It allows to export and save the entire content of the HTML Editor as PDF file easily and seamlessly without any effort both from the user and programmer's point of view. If enabled, the PDF Export can be used both like an icon on the editor's toolbar or menu item and programmatically as a component for generation of custom PDF files from the HTMLEditor. Sferyx JSyndrome EquationEditor is a full featured Visual MathML Equation Editor Java Bean component. It is suitable for use in any kind of Java applications which need advanced MathML / Equation document authoring or document creation. It includes all the necessary features to create even very complicated MathML documents visually, such as creating complex formulas and equations with many nested levels. It includes advanced copy/paste operations, easy parentheses and fences generation etc. 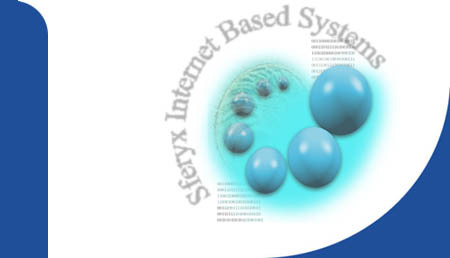 Sferyx JSyndrome HTMLBrowser Component is a powerful Java based HTML rendering component. It allows quick and easy rendering/visualization of HTML content from any java application, Oracle Forms, SWT/Eclipse and others. It requires JDK or JRE 1.3 or higher. With only a few lines of code is possible to display and render HTML or text files practically from any source.